Charlie is a washed up boxer, deadbeat dad, and up to his eyeballs in debt from gambling on giant robot fights. When he signs away custody of his estranged son, Max, for some quick cash, part of the agreement is that he takes him for the summer. Together, Charlie and Max fix up a beat up robot, training it to box. Their shared love for robot fights brings the two together, giving Charlie a shot at redemption and glory. ClearPlay’s primary work is to filter out around twenty–five instances of language, including a couple ‘S’ and ‘B’ words and a fairly frequent use of the ‘A’ word. Excepting one scene that shows what happens when you don’t pay your debts, the violence is non–gory, robot pounding on robot and left mostly intact. Filtered, Real Steel is something younger teens and up should enjoy. When I saw the trailers for Real Steel I was lukewarm about the concept, but as it turns out this isn’t some mindless, soulless, robot smashing action movie (see Transformers). It’s a well acted tale of love and redemption that also has giant robots bashing it out in the ring. While some may argue it doesn’t stray far enough from the well worn cliches of underdog fighter movies, Real Steel seems fresh, the excellent acting by Hugh Jackman in particular keeping the cheese level down. If you just want non’stop smash ‘em up robots, look elsewhere. 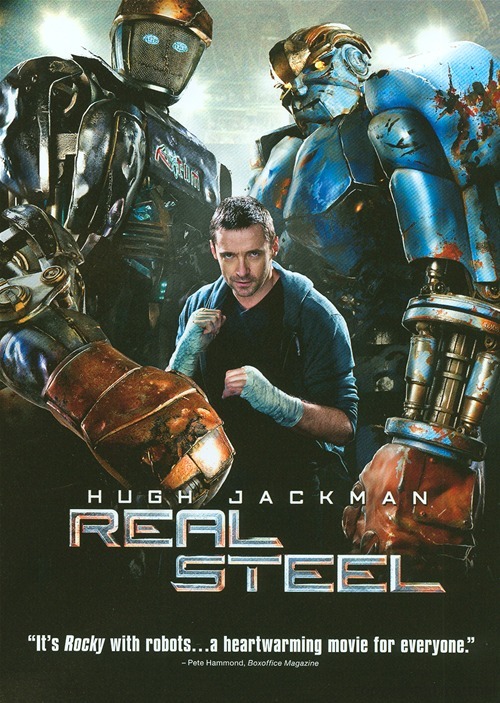 If you like a little character and story with your smash ‘em up robots, Real Steel is the real deal.